A work mentioned in a single passage of the Old Testament (Num. xxi. 14) in connection with the geographical position of Arnon. The title suggests that the book contained songs celebrating the victories of the Israelites led by Yhwh, and it seems, therefore, to have been similar to the Book of Jasher or possibly even identical with it, though there is no evidence to support the latter hypothesis. Modern scholars regard Num. xxi. 17-18, 27 et seq. as extracts from the same book (comp. Naḥmanides on Num. xxi. 14); and since some of the facts there mentioned refer to an epoch far subsequent to the Mosaic period, the last citation being supposed by Stade ("Gesch. des Volkes Israel," i. 50) to refer to the time of Omri's dynasty, the date of its composition is variously placed in the ninth century B.C. or in the reigns of David and Solomon (Reuss, "Gesch. der Heiligen Schrift," p. 172). It must be noted, however, that the Septuagint, reading , renders the title of the book Πάλεμος τοῦ Κυρίου, and refers its contents to one particular war of Yhwh. The verse which is said to be extracted from the book is extremely obscure, and the words in particular are variously but unsatisfactorily interpreted. The Septuagint renders them τὴν Ζωὸβ ἐφλόγισε, apparently reading , which is unintelligible in meaning, though it evidently contains some allusion to Dizahab. Jerome, following Onḳelos, translated "he did," although it rather means "he gave." 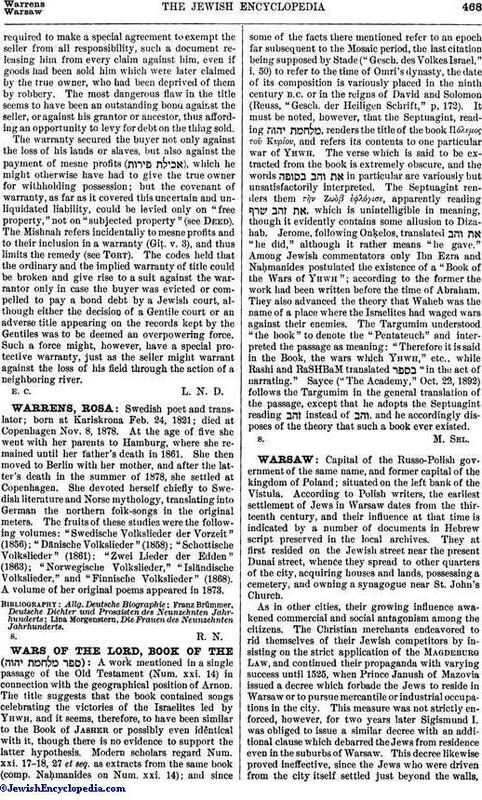 Among Jewish commentators only Ibn Ezra and Naḥmanides postulated the existence of a "Book of the Wars of Yhwh"; according to the former the work had been written before the time of Abraham. They also advanced the theory that Waheb was the name of a place where the Israelites had waged wars against their enemies. The Targumim understood "the book" to denote the "Pentateuch" and interpreted the passage as meaning: "Therefore it is said in the Book, the wars which Yhwh," etc., while Rashi and RaSHBaM translated "in the act of narrating." Sayce ("The Academy," Oct. 22, 1892) follows the Targumim in the general translation of the passage, except that he adopts the Septuagint reading instead of , and he accordingly disposes of the theory that such a book ever existed.